Recently we heard an animal making noises in our Chimney so we called Eric from Gray Brothers. They were able to come soon after I called and they were calm, insightful and fearless. He was wonderful to work with and needless to say, I highly recommend Gray Brothers Wildlife moving forward. Everyone should have Eric on their Emergency list! After noticing that we had a woodchuck living under our front steps, I called Eric and he was very helpful; answered all my questions and told me exactly what he was going to do. It only took two days and now the woodchuck has a new home. Thank you Eric! They were great. Just coming back from another emergency job and got to me in about an hour. They caught the squirrel in 10 minutes without disturbing anything in my house. It wasn't easy! 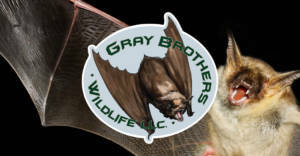 Gray Brothers Wildlife is a 5 star operation! I called several animal control people. One of the insect control people suggested I call Eric, from Gray Brothers Wildlife in Norwalk. They gave me great advice. Eric came with his bag of goodies and that same day, we had our critter ready to be relocated, humanly and safely. Thank-you Eric!